For those who don’t know, I’m a James Bond fanatic. I grew up reading the original Ian Fleming paperback novels, devoured every film, and brandished Playstation controllers to cruise video game contributions to the 007 universe. I find the mythos fascinating, the franchise dependable. It’s not Shakespeare and was never supposed to be; Bond is pure entertainment with a trusty edge of class. The series has had its high points (Goldfinger, Goldeneye, Thunderball) and low points (Moonraker, Die Another Day) but Quantum of Solace is almost absent from the list entirely. The producers have misstepped, and they have Bond 23 to make things right. One major problem is today’s penchant for disorienting quick-cuts and frenetic editing which nearly derailed the later Bourne films for me. When I watch a movie I want to see what’s going on; the new fetish for jerky cameras makes me want to clobber someone and then force a diazepam down their throat. The Bourne Identity didn’t suffer from this problem. Neither did earlier Bond films. I always knew what the hell was going on. But for this latest Bond film, the way the fun and color have been bleached out of the proceedings. Bond is a killer, sure, yet he dwells in a brighter universe than ours and his adventures — even when they concern death — are never morose for long. QOS is morose from beginning to end. The only time it channels its roots is when the classic Bond music starts playing towards the film’s final fifteen minutes, and that served to remind me of another gripe: Where was that music all along? 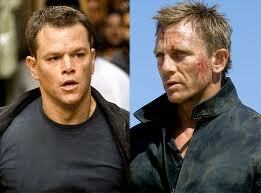 The Bond films are not the Bourne films, however. Bourne is an everyman; Bond is larger-than-life. Bourne is almost nihilistic; Bond is fundamentally optimistic. Bourne exists in our world; Bond is a resident of a loftier dimension. Our unique place in history is, if nothing else, a merciless crucible of transformation. Yet Bond pulls off something quite rare: he remains immortal. The agendas of his enemies alter; Stromberg in The Spy Who Loved Me aspires to start a war to wipe out Earth’s existing civilizations, while Tomorrow Never Dies finds a Rupert Murdoch-style villain desiring war for the sake of ratings. And consider the ever-changing title songs which date each film in a paradoxically endearing way. From the incomparable Shirley Bassey (if ever there was a voice for 007, hers is it) to Shirley Manson to Chris Cornell, the Bond songs themselves provide an irresistible panorama of cultural metamorphoses, an auditory document complementing the cars, bikinis, and gadgetry. Yet while the singers change, the classic Bond theme introduced in Dr. No continues thumping, rising, and trumpeting to his every cool step. We love our heroes. Legend says that Alexander the Great used to sleep with a copy of The Iliad under his pillow, because its star Achilles was his hero. I can easily envision future military leaders napping with the 007 series resting on a nightstand shelf. The Bond films have seen 22 official installments with six different actors (or avatars) stepping into 007’s finely-polished shoes. Classic Connery, undersung Lazenby, lighthearted Moore, cold Dalton, smooth Brosnan… and now Daniel Craig, who brings his own brand of point-blank brutal efficiency to the role and may, just may, achieve the closest incarnation to Fleming’s original creation. The problem with the new Bond isn’t Daniel Craig. The problem is that the producers are yanking the Bond train off the tracks. Gone are the gadgets, the stylish gun barrel opening, Moneypenny and Q. Without these ingredients the franchise falters. I thought Casino Royale was a great installment to the series and was willing to grant the benefit of the doubt. This was a new Bond in a clever reboot, and Craig managed to deliver a witty, magnetic, cold, and brutal performance. He balanced such elements masterfully and was aided by a top-notch production and script. Now, the benefit of the doubt is gone. It’s time to get back on track and give us the Bond who has lasted.